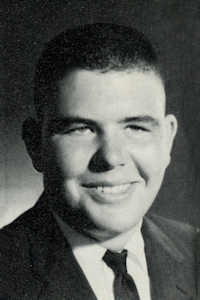 Obituary – Hicks, Keith Stanley « Perry High School Alumni Association, Inc.
﻿Band 62-65, Wrestling 6264, Jr. Play 63-64, Stage Band 62-64, Football 63-64. Keith Stanley Hicks, 54, of Clearwater, Kan., died Monday, April 2, 2001. He was a insurance adjuster. Funeral will be at 10 a.m. today at Bethel Baptist Church in Wichita, Kan. Graveside service will be 3 p.m. today at Grace Hill Cemetery in Perry, Okla., under the direction of Cochran Mortuary & Crematory of Wichita, Kan. He is survived by his wife, Connie; two daughters, Katherine Rowe of Sedgwick, Kan., and Cynthia Hicks of Clearwater; his mother, Katherine Hicks of Roland; a sister, Karen Friedemann of Laughlin, Nev.; a brother, Kyle Hicks of Inola, Okla.